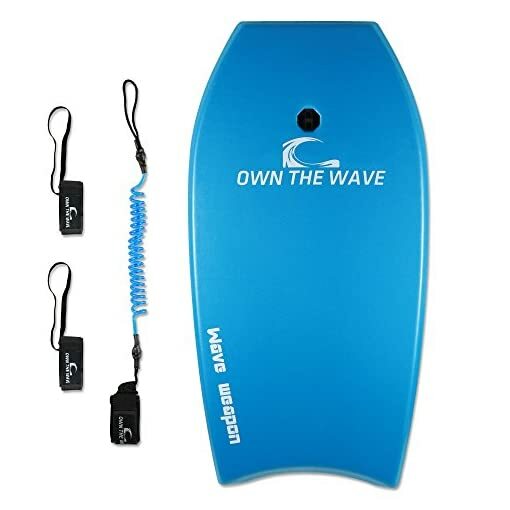 The ‘Beach Attack Pack’ comes with a Super lightweight Own the Wave ‘WAVE WEAPON’ Body Board, plus Own the Wave’s fantastic PREMIUM coiled bodyboard leash ($16.99 on its own), plus a set of fin tethers to make sure you don’t lose your swim fins in the waves. PLEASE NOTE: Leash and Fin Tethers will be at the very bottom of the board wrapped in a tight bundle underneath the plastic wrapping. You will be receiving your purchase together with printed instructions written by us (with photos of course!) on how to install your leash and use your fin tethers. 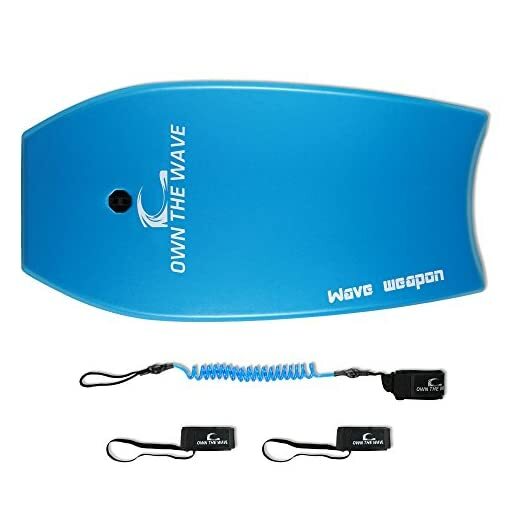 We’ll also tell you how to look after your WAVE WEAPON Body Board by leaving the board ‘white side up’ when in the sun. 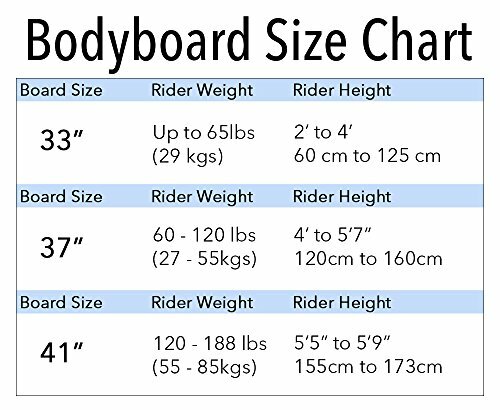 (This is the same for ALL ‘soft’ surfboards, Body-boards and SUP’s as this stops air pressure building up within the board). 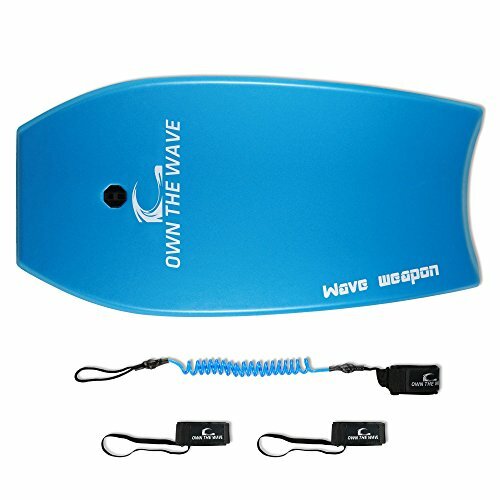 The ‘Beach Attack Pack’ comes with a Super lightweight Own the Wave ‘WAVE WEAPON’ Body Board (check your size using the size recommendation chart), plus Own the Wave’s fantastic PREMIUM coiled COLORED body board leash ($16.99 on its own), plus a set of fin tethers to make sure you don’t lose your swim fins in the waves. PLEASE NOTE: Leash and Fin tethers will be at the very bottom of the board wrapped in a tight bundle underneath the plastic wrapping. 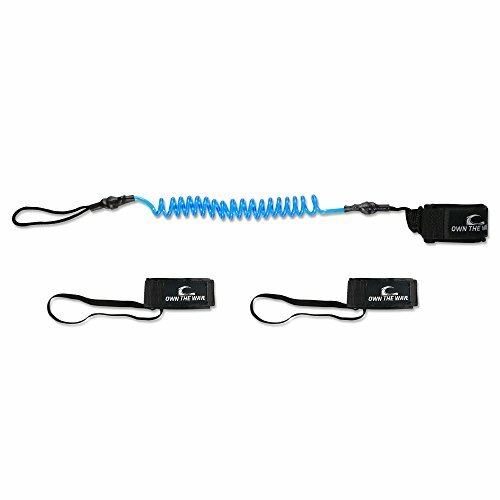 When you purchase you will be emailed instructions written by us (w/ photos) on how to install your leash and use your fin tethers. We’ll also tell you how to look after your Wave Weapon Body Board by leaving the board ‘white side up’ when in the sun. (This is the same for ALL ‘soft’ surfboards, Body-boards and SUP’s as this stops air pressure building up within the board). Buy with TOTAL confidence – each ‘Beach Attack Pack’ has a SERIOUS guarantee – if you are not 100% satisfied on delivery your board will be replaced or refunded (you choose) – and then the board is guaranteed against any defects for a FULL 12 MONTHS – And like ALL products from ‘Surf and Snow Warehouse ‘ these Boards are stored and shipped to you by Amazon in the US. Thank you for looking at a product from our store – Surf and Snow Warehouse. We are a small family business that ONLY sells what we know and love – water sports gear. We know our products, use our products, and stand behind them 100% (please do check our feedback) – So if you have any questions about using any of our products please just ask. 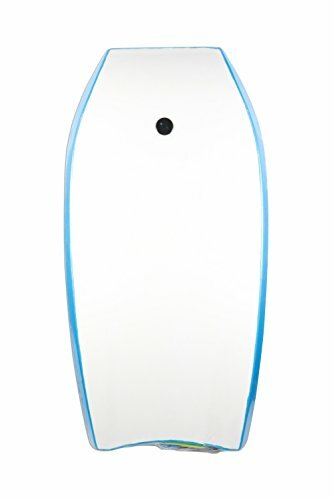 The WAVE WEAPON Body Board is amazingly light and features a high speed slick bottom surface, an EPS core, bottom rear channels for great performance and a crescent tail to further help performance. Just choose your colour – Blue, Pink or Green. 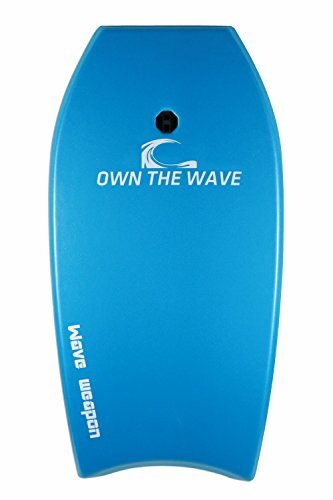 The Premium leash included will keep your board attached to you at all times and is super comfortable (please check its reviews), as are the fin tethers included to look after your precious swim fins. 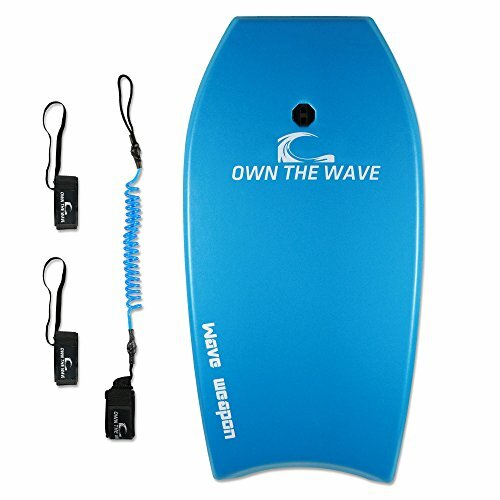 The ‘Beach Attack Pack’ comes with a Super lightweight Own the Wave ‘WAVE WEAPON’ Body Board (check your size using the size recommendation chart), plus Own the Wave’s fantastic PREMIUM coiled COLORED body board leash ($16.99 on its own), plus a set of fin tethers to make sure you don’t lose your swim fins in the waves. PLEASE NOTE: Leash and Fin tethers will be at the very bottom of the board wrapped in a tight bundle underneath the plastic wrapping. When you purchase you will be emailed instructions written by us (with photos of course!) on how to install your leash and use your fin tethers. We’ll also tell you how to look after your Wave Weapon Body Board by leaving the board ‘white side up’ when in the sun. (This is the same for ALL ‘soft’ surfboards, Body-boards and SUP’s as this stops air pressure building up within the board). Buy with TOTAL confidence – each ‘Beach Attack Pack’ has a SERIOUS guarantee – if you are not 100% satisfied on delivery your board will be replaced or refunded (you choose) – and then the board is guaranteed against any defects for a FULL 12 MONTHS – And like ALL products from ‘Surf and Snow Warehouse ‘ these Boards are stored and shipped (quickly and reliably) to you by Amazon in the US. Thank you for looking at a product from our store – Surf and Snow Warehouse. We are a small family business that ONLY sells what we know and love – water sports gear. We know our products, use our products, and stand behind them 100% (please do check our feedback) – So if you have any questions about using any of our products please just ask. Thank you. 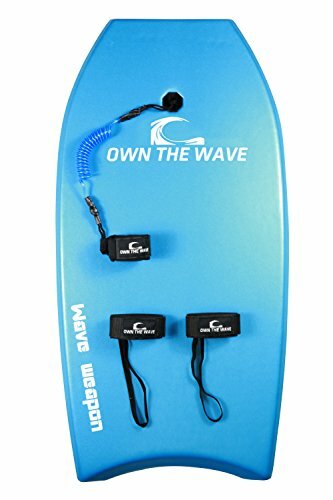 The WAVE WEAPON Body Board is amazingly light and features a high speed slick bottom surface, an EPS core, bottom rear channels for great performance and a crescent tail to further help performance. Just choose your colour – Blue, Pink or Green. 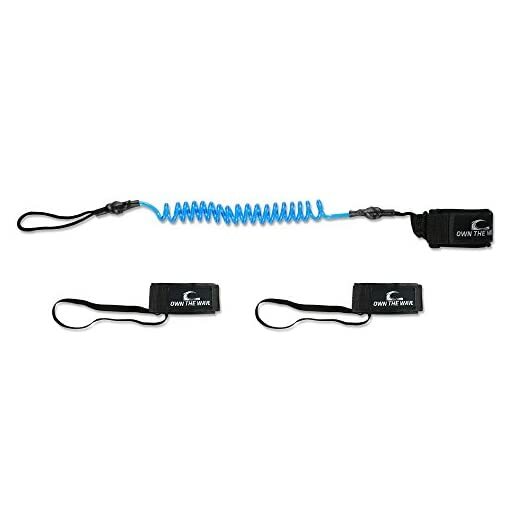 The Premium leash included will keep your board attached to you at all times and is super comfortable (please check its reviews), as are the fin tethers included to look after your precious swim fins.